The Emmy Award-winning series UNITED SHADES OF AMERICA WITH W. KAMAU BELL will premiere its 4th season on Sunday, April 28 at 10pm ET/PT. Produced by Main Event Media and All3Media America, United Shades of America is an eight-part Emmy Award-winning CNN Original Series that follows sociopolitical comedian W. Kamau Bell as he explores communities across the country to understand the unique challenges they face. In the season four premiere, Bell heads to Dallas to learn about the business of megachurches. In subsequent episodes he will explore the experiences of Hmong Americans, black Midwesterners, white activists in Seattle, women fighting for reproductive justice in Mississippi, the LGBTQ+ community in Salt Lake City, and residents of D.C. that represent a vibrant culture distinct from the politics surrounding them. United Shades of America will stream live for subscribers the day of premiere via CNNgo (at CNN.com/go and via CNNgo apps for Apple TV, Roku, Amazon Fire, Samsung Smart TV, and Android TV) and on the CNN mobile apps for iOS and Android. The series will also be available the day after the broadcast premiere on demand via cable/satellite systems, CNNgo platform, and CNN mobile apps. Award-winning comedian, writer, and actor NATALIE PALAMIDES brings her hit solo shows LAID and NATE to New York for the first time ever this June. Palamides will perform two separate show runs at The Bell House in Brooklyn, performing LAID on June 4, 5, 6 and NATE on June 11, 12, 14. After winning Best Newcomer at Edinburgh Comedy Awards for LAID, Palamides returned to the festival the following year with her show, NATE, which proved to be just as genius and just as well received, winning the prestigious Edinburgh Total Theater Award. New York audiences will get the chance to see both award-winning shows for the first time this summer. LAID and NATE are directed/co-devised by Edinburgh Comedy Award Winner, Dr. Brown. Natalie Palamides is an award winning comedian known for her absurdity, unique style, commitment to her characters, and ability to make you laugh while pulling at your heartstrings. In addition to her many accolades for her onstage performances, on television Palamides can be heard as the voice of Buttercup on Cartoon Network’s the Powerpuff Girls, and you may spot her in a commercial here and there. Other credits include Bob’s Burgers, Comedy Bang! Bang!, Star vs. The Forces of Evil, Corporate, Please Understand Me, and Tangled: The Series. Natalie was also named one of Timeout LA’s 10 “Comedians to Watch” in 2019 and Vulture’s 20 Comedians You Should and Will Know in 2017. She’s from Pittsburgh, Pennsylvania and is based in Los Angeles, California. Composer, songwriter, performer, and Minnesota music legend MARK MALLMAN today releases his debut book, The Happiness Playlist (Think Piece Publishing), an uplifting memoir written about the months he spent listening exclusively to feel-good music as an experiment to make his way through varying bouts of grief brought on by the death of his mother, the end of a relationship, and winter in the frozen Midwest. A true story of a soul beset by grief and healed by music, The Happiness Playlist is sure to connect with anyone who’s ever hung onto a song like a lifeboat. Mark Mallman has spent the last 20 years releasing albums, touring, and becoming a Minneapolis music icon. His expansive catalog of infinitely catchy and masterfully orchestrated songs has rocked the airwaves worldwide from MTV to NPR and he has been written up by critics from USA Today to Wired and NME. Comedian KARA KLENK releases her debut comedy album ‘UNDEFEATED’ today, Friday, March 8 via ASPECIALTHING RECORDS. Taped live in her old NY stomping grounds with cover illustration by “Sweet Valley Twins” artist James Mathewuse, Kara’s album is perfection inside and out. Her stand-up, which has been praised as “resigned, astute and delightfully bitter” (Time Out New York), shines bright in her stories about her appearance on Dateline, being rich people adjacent, dance schools, lost cats and crazy people in New York, the pop trickery of Christian music, and more. Kara Klenk is a stand-up comic, writer, and actor based in Los Angeles by way of New York where she was named by Time Out New York as one of the Top 10 Funniest Women in NYC. She has appeared all over television and the Internet and has written for Comedy Central, Netflix, MTV, TVLand, and Nickelodeon. Kara is the co-host of the live comedy show ‘Better Half’ alongside husband Jared Logan. She also produces/hosts a long-running stand-up show ‘If You Build It’ at the Upright Citizens’ Brigade Theaters in NYC and LA. ASPECIALTHING RECORDS is a Los Angeles-based independent comedy record label owned and operated by Matt Belknap and Ryan McManemin. Stemming from an online message board, aspecialthing (AST) records has taken a D.I.Y. approach to producing and distributing the finest stand-up comedy albums since 2006. AST is home to Patton Oswalt’s Grammy Award-winning album ‘Talking for Clapping’ as well as outstanding releases from Bob Odenkirk, Paul F. Tompkins, Doug Benson, Greg Proops, Jen Kirkman, Wyatt Cenac, Karen Kilgariff, Kyle Kinane, and many more. AST looks forward to expanding their catalog while continuing their dedication to exceptional emerging and established comics. FADER FORT, one of today’s most sought-after live music events, returns to Austin, Texas for three days of live programming on March 13, 14, and 15. FADER FORT will again host an exclusive experience at multi-use, indoor and outdoor space located at 1501 East 7th Street, featuring some of the most influential names in music and culture this year including Megan Thee Stallion, Omar Apollo, Charly Bliss, Queen Key, Novelist, Lil Gotit – and more. In its 17th consecutive year, FADER FORT has hosted over 900 unforgettable performances from artists including Drake, Billie Eilish, Kendrick Lamar, Cardi B, Khalid, Amy Winehouse, Chance the Rapper, Kehlani, Kacey Musgraves, and many more. Offering fans unparalleled access to both influential, emerging talent before they hit superstardom and widely-celebrated, iconic artists, FADER FORT is a home base for music discovery and fosters creative and personal connections both on and off the stage. In addition to providing live programming from daytime into the evening, as well as immersive and innovative on-site activations for fans, FADER FORT and Spotify Premium will be introducing panel programming for the first-time ever at the festival, accessible to Spotify Premium subscribers. Further details on the panels, and more at FADER FORT including additional artist performances, to be announced at a later date. The FADER, the media company behind FADER FORT, releases The FADER magazine’s spring style issue later this month. Two of the three cover stories have already been revealed, featuring Blueface and Billie Eilish. This 116th issue of The FADER is available for pre-order at The FADER’s shop here and will be on newstands in mid-March. Courtesy of The FADER, the recently released collectable photography book FADER FORT: Setting The Stage will be available for purchase on-site at FADER FORT with a special 20% off discount available to guests. The commemorative retrospective about FADER FORT features never-before-seen portraits, candids, performance photos, and personal stories commemorating over 15 years of FADER FORT, and includes personal intros from FORT performers Damon Albarn and Sean “Diddy” Combs. Additionally, the book is available now at The FADER’s shop here and at select retailers including Brooklyn Academy of Music, Kinfolk, KITH, and more. Austin FC, recently named the 27th club in Major League Soccer, will be the first major league team in the history of the culturally dynamic city of Austin when it begins play in MLS in 2021. Austin FC will partner with FADER FORT to provide Austin FC supporters and Austinites with a unique opportunity to attend the legendary FADER FORT via Austin FC social platforms. INTRINSIC Wine Co. will be the exclusive wine partner at FADER FORT, pouring innovative wines inspired by urban culture and the parallels between street art and winemaking. RED will be showcasing the new HYDROGEN One smartphone, the world’s first 4-View media machine that’s better than 3D without the glasses. The RED HYDROGEN War Wagon will be onsite allowing fans to experience a whole new world of content and enter to win a chance to take one home. Select, a trailblazing canabis brand, joins FADER FORT as the first-ever cannabis partner. Pushing normalization of cannabis by stepping into the music space, Select is introducting FADER FORT tastemakers to the intersection of art, culture – and cannabis. smartwater will debut “smartbeats,” an initiative that blurs the lines between music and technology with the help of a curated group of musicians. During FADER Fort, smartwater will announce the lead “smartbeats” artist followed by an in-depth conversation with influential smartwater ambassadors speaking on the topic of music and wellness. The new initiative is a continuation of smartwater’s commitment to the fusion of culture, music, and wellness building on past and future partnerships with The Big Quiet and ongoing work with smartwater’s Creative Wellness Director, Joe Holder. Spotify Premium, along with presenting panel programming co-curated with The FADER, will provide additional elevated experiences for Spotify Premium subscribers including fast-track entry into FADER FORT, a special viewing platform, and more. TikTok, the short-form video destination recently ranked #1 in App stores, will be screening memes and special entertainment on-stage between live sets, as well as launching the FADER FORT #ImWithTheBand hashtag where fans can post videos on the platform. FORT guests with the TikTok app on their mobile device are invited to the TikTok Power Lounge to charge up, wind down and try their hand for a chance to score limited edition merch. Xbox will be providing exciting experiences to fans at FADER FORT, including presenting the VIP Xbox Gaming Lounge that will feature Xbox Game Pass game play exclusively for performing artists and VIPs. FADER FORT attendees will get a chance to learn more about Xbox Game Pass, the gaming membership with over 100 high-quality games for one low monthly price, including receiving free trials while waiting in the entry line. Sign up for The FADER’s newsletter here. Launched in 1999 and founded by Rob Stone and Jon Cohen, The FADER is an award-winning, ahead-of-the-curve music, style, and culture global media company and the unofficial guide to what’s next in music. Led by President and Publisher Andy Cohn, The FADER is credited with giving early exposure to top artists including Kanye West, Bon Iver, Kendrick Lamar, Outkast, The Strokes, Drake, and The White Stripes. The FADER brand has expanded in innovative ways, providing a cross-platform reach across print, digital, mobile, and social media, including award-winning film and video, and sought-after experiential events.The FADER’s celebrated flagship live music event, FADER FORT, presents some of today’s most innovative programming and emerging artists to fans. ‘IT STARTED AS A JOKE’ is a feature comedy documentary that chronicles the decade-long run of the Eugene Mirman Comedy Festival – including the final farewell show – directed by Julie Smith-Clem and Ken Druckerman. 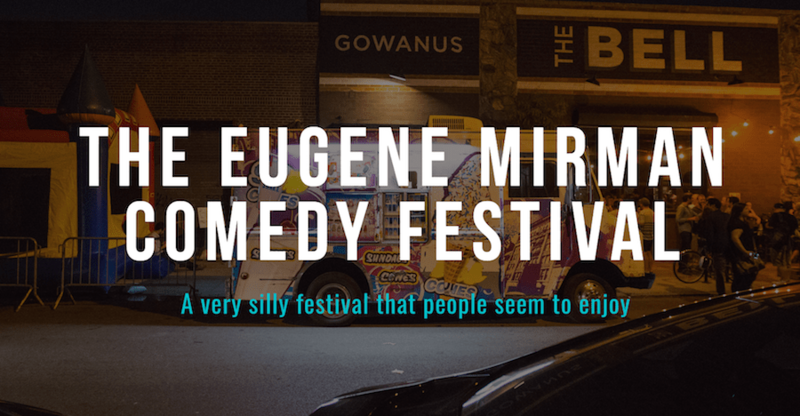 The film celebrates Eugene’s unique brand of humor and his role in the alternative comedy movement, offers a bittersweet goodbye to an era, and reminds us of the healing properties of comedy – even in the most challenging of life’s circumstances. The film includes interviews with Michael Ian Black, Kristen Schaal, Wyatt Cenac, Ira Glass, John Hodgman, Kumail Nanjiani, Reggie Watts, Michael Showalter, Janeane Garofalo, Jim Gaffigan, Jon Glaser, Mike Birbiglia, Bobcat Goldthwait – and more!